Stars January 9th, ends February 13th. Film comedy from the 1930s to the 1950s. ​Film comedy from the 1960s - 2000s. Join us this summer for a look at 1939 Hollywood's Greatest Year. You've seen Gone With the Wind and The Wizard of Oz, but now we will watch some more of the films from 1939 that make it such an extraordinary year. John Ford directs John Wayne in Stagecoach, his A-List, breakout role in a genre defining Western. Charles Boyer and the delightful Irene Dunne in Love Affair, the movie that spawned 2 remakes. Jean Renoir, son of the impressionist painter, August Renoir, directs one of the most beloved films in history, The Rules of the Game. Howard Hawks directs Cary Grant and Jean Arthur in Only Angels Have Wings. Robert Donat beats out Clark Gable for Best Actor in Goodbye, Mr. Chips. And finally, The Women, a movie ahead of its time with an all female cast. Sponsored by HOLY HOUND TAPROOM! This class will focus on two directors, John Huston and Stanley Kubrick. The Killing/Paths of Glory (1956/1957) Double Feature! Let us know if you'd like to be on the stand by list on a given evening. Come in, if there's a seat available, pay your $10 and come on in! 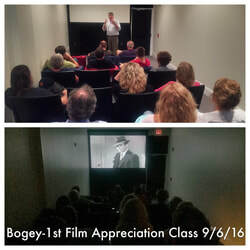 Film Appreciation Fall 2016 - SPONSORED BY HOLY HOUND TAPROOM! Cost $100 - Payments due in theater before first class on September 6th. All payments will be due in the theater before the first class on September 6th. Need 1 more student to make this class go. Call your friends and neighbors!